… The Commissioner’s Trophy, which is awarded to the Major League Baseball’s (MLB) Champion. The other professional sport league awards are named after Lord Stanley (the Stanley Cup -NHL), Vince Lombardi (the Vince Lombardi Trophy -NFL), and Larry O’Brien (Larry O’Brien Trophy – NBA). Winning the Commissioner’s Trophy brings tears of joy to the eyes of grown men, and to a city starved for a winner. It is an experience seeing the streets of a city fill to capacity with cheering passionate fans. As Mitch “Wild Thing” Williams (ex-player and current broadcaster) said so accurately “winning the championship allows all of us to act as if we are all 8 years old once again”…without a care – experiencing sheer joy. Winning the ultimate award in your profession, after years of sacrifice and hard work, brings emotion – heartfelt, deep emotion. The presentation of the Commissioner’s trophy captures and symbolizes the accomplishment. The Commissioner’s Trophy, designed by Lawrence Voegele, of Owatanna, Minnesota, was first awarded in 1967, when the St. Louis Cardinals defeated the Boston Red Sox. The trophy is unlike the Stanley Cup, which is passed down, year by year, to the champions of the National Hockey League, a new Commissioner’s Trophy is created each year, much like the Vince Lombardi Trophy of the National Football League and the Larry O’Brien Trophy of the National Basketball Association. 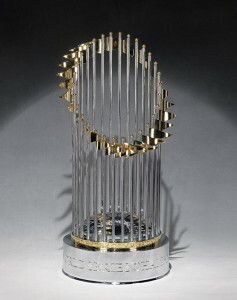 The current trophy, was redesigned slightly in 1999 and made by Tiffany & Co and presented for first time at the conclusion of the 2000 World Series, which was won by the New York Yankees. The trophy is presented to the ownership of the World Series-winning team by the Commissioner of Baseball. In addition to the team trophy, each player recieves a World Series Championship Ring. It is made of sterling silver and is 24 inches tall, excluding the base. It is 11 inches around and weighs approximately 30 pounds. 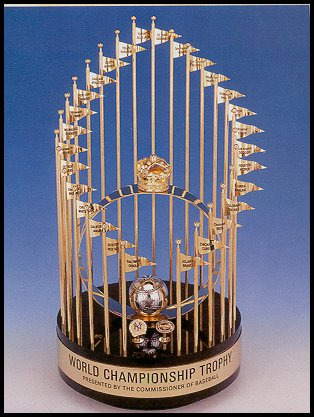 The trophy features 30 gold-plated, hand-furled flags, one for each of the Major League teams. The flags surround and rise above an arched silver ox baseball with latitude and longitude lines that symbolize the world. The baseball also contains 24-karat vermeil baseball stitches. The baseball itself weighs over 10 pounds. The base contains the inscription and the signature of the commissioner. The estimated value of the trophy is approximately $15,000. The front design has been changed slightly from the last modification in 1999, now having two different size bases. The previous design contained a gold crown at the top of a haloed gold metal circle with a silver metallic baseball at the base. Two logoed pins, representing the winning teams, were mounted in front of the metal halo. This design proved too delicate, which necessitated the redesign. The Commissioner’s Trophy is awarded each year by Major League Baseball to the team winning the World Series. The World Series is played between the champion clubs of the American League and the National League, which collectively include 30 clubs based in the United States and one club from Canada. The “modern” World Series has been an annual event since 1903. Baseball has employed various championship formulas since the 1860s. When the term “World Series” is used by itself, it is usually understood to refer to the “modern” World Series exclusively. The first modern World Series was between the Boston Americans (as in “American Leaguers” — now the Red Sox) of the American League and the Pittsburgh Pirates of the National League in 1903. Boston won the Series 5 games to 3, helping to establish the new league’s credibility. However, the next year, the National League champion New York Giants refused to play the American League champions (Boston again) because of the alleged inferiority of the American League, along with the legitimate claim that there were no formal or standard rules for this championship (a factor which had helped kill the 1880s version of the Series). In response, the World Series was instituted in 1905 as a permanent institution, through which the leagues would “meet annually in a series of games for the Professional Base Ball Championship of the World. The original World Series held in 1903, was a best of nine affair. No World Series was held in 1904 and the best of seven series was used until 1919. The five-of-nine format was used from 1919 through 1921, but it reverted back to a best-of-seven series in 1922. That is the same format used today. This entry was posted in Uncategorized on October 30, 2008 by admin.